This is one of the most important homeopathic medicines for anxiety-related disorders. This drug that is prepared from the nitrate of silver. It specifically affects the mind causing neurotic effects. It also has curative effects on the affectations of the nervous system, digestive system, reproductive system, respiratory organs, musculoskeletal system, etc. The patient is very nervous and impulsive by nature; extremely hurried in whatever he does. He dreads situations that may cause him anxiety and tries to avoid getting into such situations. Multiple phobias such as fear of darkness, evil, fear of heights, tall buildings, of passing certain places, etc. anticipatory anxiety which causes diarrhea before any important event or function. Intense apprehension and worry about trifling matters. All this anxiety causes much brain fag and the patient feels as if time passes too slowly. Physical symptoms of anxiety very marked such as trembling of hands and feet, palpitations in the chest, shortness of breath, dizziness, and fainting, dryness of mouth, stammering, excessive sweating, etc. All in all a very good homeopathic medicine for generalized anxiety disorders, social and specific phobias, stress disorders, panic attacks and also for agoraphobia. Lycopodium is prepared from the spores of a fungus called as club moss. It is an inert substance until it undergoes the process of potentization to reveal its latent curative powers. Lycopodium is a deep acting, constitutional remedy having a very wide sphere of action. It positively affects the mental sphere, general nutrition, urinary system, gastrointestinal system, reproductive system, lungs, skin, etc. It is frequently used homeopathic medicine for anxiety disorders, social phobia, nephrotic syndrome, urinary infections, dyspepsia, pneumonia, liver diseases, ascites, skin complaints like eczema, abscesses, acne, urticaria, etc. It is commonly used homeopathic medicine for fears and anxiety when there is Intense fear of going in public places and performing in public. The patient dreads public appearance even if his profession demands it. Intense fear of not being able to perform well and fear of negative evaluation by others. Anticipatory anxiety is marked and there is a total loss of self-confidence. Constant apprehension and fear of breaking down under stress. Silica positively influences the mind, bones and joints, mucous membranes, skin, cellular tissue, nerves, glands, lungs, digestive system, etc. Silica is one of the frequently used medicines for complaints of anxiety disorders, depressive states, styes, chalazion, vitiligo, eczema, lichen planus, herpes, urticaria, asthmatic bronchitis, pneumonia, tuberculosis, trigeminal neuralgia, complaints of nails, tonsillitis, etc. It's frequently used one of the best homeopathic medicine for anxiety and fears in conditions like generalized anxiety disorders, social phobias, and specific phobias. Generally, very nervous and timid patients who are afraid of stressful situations like public performances and exams, etc. They startle at the slightest noise due to nervousness. Marked anticipatory anxiety is an important feature of this drug. This is a drug prepared from a plant Thuja Occidentalis commonly known as Arbor Vitae. This is deep acting remedy with a wide sphere of action. It is a constitutional remedy, of great use in many disease processes. It has a profound action on the mental sphere, respiratory organs, skin, genito-urinary organs, joints, nervous system, glands, kidneys, blood, etc. It is a good drug not only for physical complaints but also for the affection of the mind. For example, it can be very useful in anxiety disorders, psychotic states, depression, etc. Its one of the frequently indicated remedies for asthmatic bronchitis, inveterate skin troubles and chronic stubborn skin conditions like lichen planus, psoriasis, eczema, warts, pyoderma, etc. Thuja is one of the very good homeopathic medicine for generalized anxiety disorders and obsessive-compulsive neurosis. The patient generally gets anxious over trifles and cannot concentrate on whatever he does. He has many fixed ideas and he finds it difficult to get rid of them. Social phobia is also commonly seen in these patients who begin to get nervous and get twitching on being approached by strangers. Overall a very good drug for controlling anxiety states. Syphillinum is a deep acting, polychrest remedy affecting multiple systems of the body. Syphillinum is frequently used homeopathic medicine for anxiety and fears in the treatment of obsessive-compulsive disorders, anxiety states. It is also useful in the treatment of vitiligo, recurrent abscesses, osteomyelitis, trigeminal neuralgia, alcohol dependence, rheumatic complaints, etc. It's a useful drug to combat diseases that are destructive in nature and are deep-seated. An important feature of these patients is that they repeatedly wash their hands and they feel compelled to do so in order to relieve their anxiety. Marked fear of night time, the patient dreads the approach of night. There is intense anxiety and a constant feeling that he (the patient) may go insane. This is a wonderful example of a drug prepared from an inert substance like common salt. After undergoing the process of Potentization, the inner healing powers of common salt are brought to the surface and thus is borne a deep-acting constitutional remedy. Natrum muriaticum is one of the most commonly used medicines in homeopathy It can be used for a wide range of disease processes and has a very broad spectrum of action. It can effectively tackle diseases affecting the mind, skin, gastrointestinal organs, nose, lungs, kidney, metabolism, muscles, head, hormonal system, etc. It is one of the commonly used remedies for acute stress disorders, post-traumatic stress disorders, generalized anxiety disorders, lichen planus, migraine, urticaria, eczema, vitiligo, asthma, etc. Natrum muriaticum is an excellent remedy for diseases affecting the general nutrition of the body and for anemia, fevers, thyroid affections, etc. Not only the physical ailments but also the psychic affections come under the domain of this wonderful drug. Anxiety disorders, depressive states, mood swings, irritability, etc can be well tackled with this remedy. All in all, this is a multi-faceted drug that can be used for many of the disorders affecting mankind. 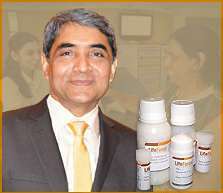 It is commonly used homeopathic medicine for anxiety disorders. It's a good drug for acute stress disorder and post-traumatic stress disorder that has been triggered by the sudden death of someone close. The patient, in such cases, repeatedly re-experiences the traumatic event in the mind and constantly broods over it. Sleep disturbances are a common occurrence. Startling at the slightest noise, spells of intense anxiety, trembling of extremities are other common occurrences.